Are you looking for the perfect beach wedding music or soothing sounds for your event? 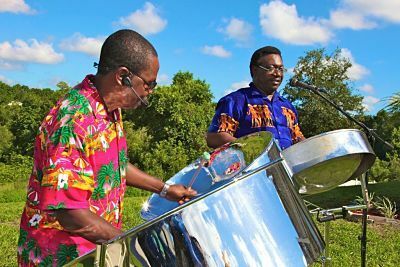 Then look no further than RythmTrail steel drum band for the ultimate in calypso, soca, reggae and steel drum music for your party! RythmTrail offers over 20 years of musical experience from native Caribbean islanders, so you can be sure you’re going to get the best steel drum music for your wedding, reception, convention or corporate event. Choose your own favorite songs or let RythmTrail enhance your ceremony music with the romantic sounds that can transport audience members of all ages to a tropical paradise. RythmTrail can play beach weddings in Bradenton as well as events both nationwide and internationally, so you can be sure you’re going to get the best music wherever and whenever you need it. So what are you waiting for? Get the best steel drum players to give you a quote for your event and you and your guests will enjoy an unforgettable tropical island experience like no other. Its almost a week later, and everyone is still talking about how great the wedding was and how perfect the steel drum band was .. you guys did a wonderful job!! the Caribbean theme was a hit and you guys were the icing on the cake. I thank you soooo much !! my husband and i loved your selection of music It was superb!! We would hire you again in a minute and we also highly recommend you !!! we will send you some pictures to post on your website.. thanks again!